You already know the importance of keeping your WordPress website updated and secure. But what about regular maintenance? 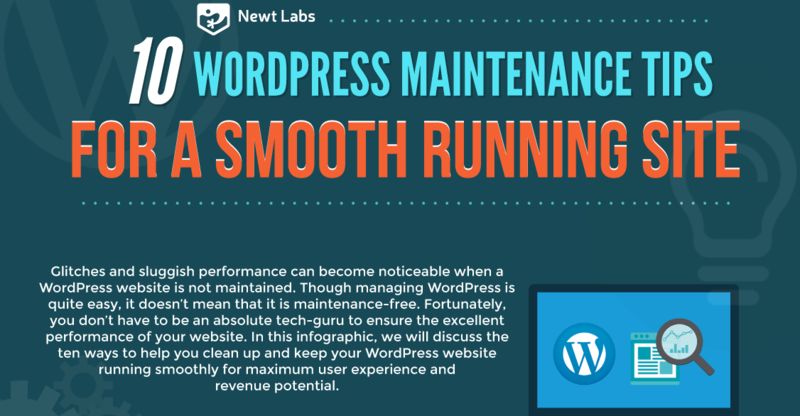 WordPress maintenance is more than just using plugins. You can use several tactics to keep your site in great shape so it runs full-speed ahead. When your website is taking quite some time to load or is packed with random errors, it means it requires regular maintenance. Use the ideal tips and tricks as a regime to keep your WordPress website run smoothly. Newt Labs recently shared a thoughtful infographic with 10 amazing tips for website owners to schedule into their workflow to prevent issues.